The Project consists of the replacement of the Highway 3 Grand River Bridge located just west of Cayuga, Ontario. 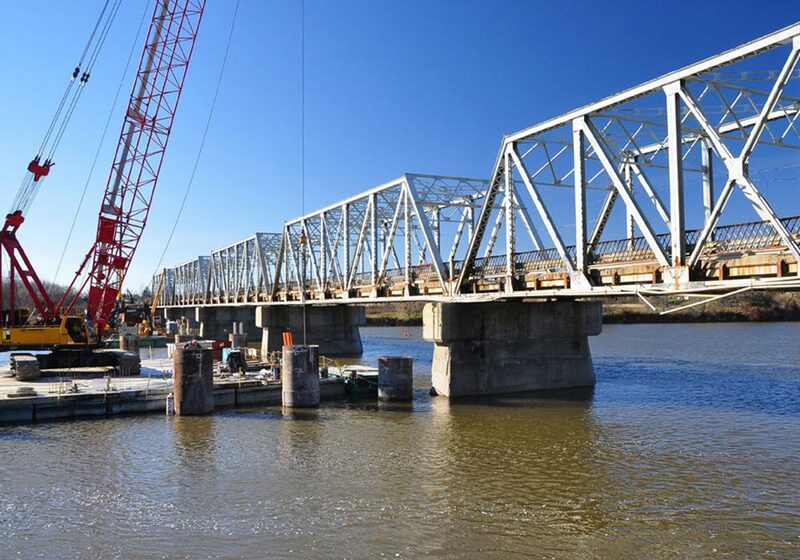 The existing bridge is a five span steel truss with concrete deck, piers and abutments. Construction of a dock along the shores of The Grand River for barge access. Installation of independent temporary piers and foundations adjacent to the existing bridge. 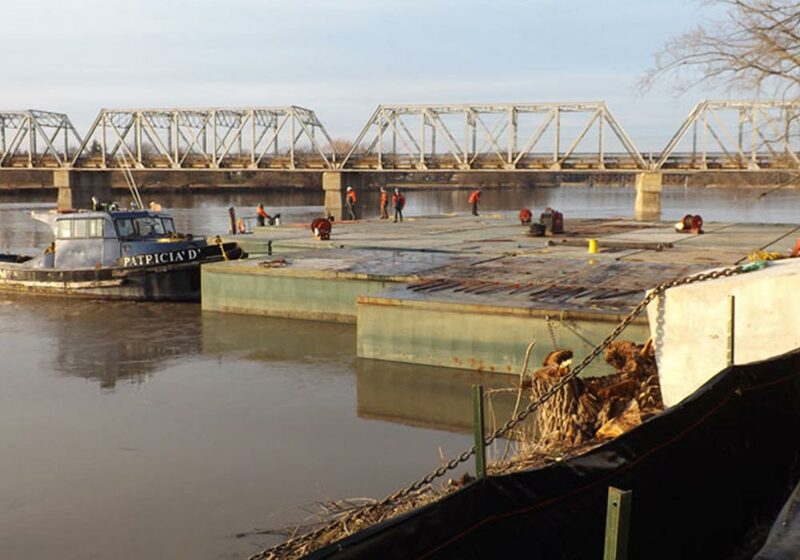 Installation of the foundation and substructure to occur off of the barges. Installation of girders. The girders will be installed from a barge by a crane. Form and pour cast in place deck. Installation of temporary retaining wall and shoring to allow for construction of detour approaches. Detour traffic from the existing structure to the new structure. Removal of deck on the existing structure at the piers. Installation of work platform around the existing piers to allow for pier cap widening. Sawcut existing deck and remove concrete by lowering the deck sections onto barges located below. Removal of existing truss spans. Truss spans to be cut apart and lowered onto barges located below. 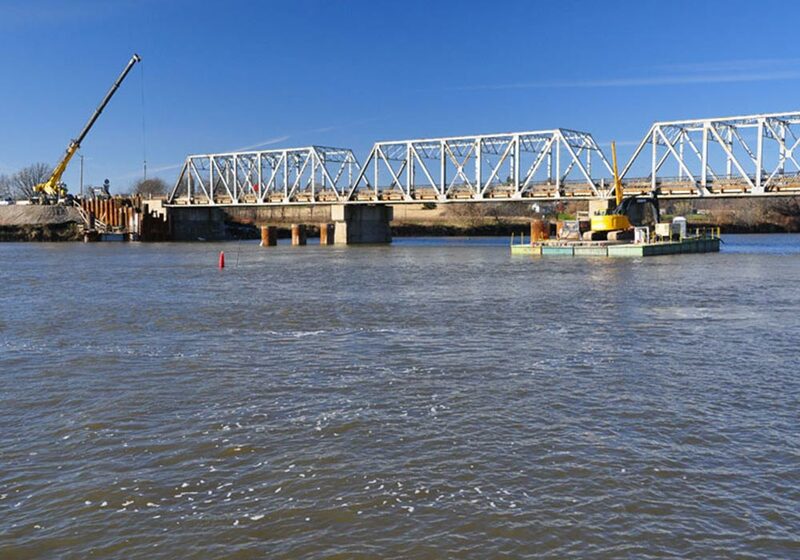 Utilization of the new bridge as a work platform to rehabilitate and widen the existing piers. Installation of a temporary skid-way for the temporary foundation to the existing rehabilitated and widened piers. Jack up the new bridge and install rollers. Jack the entire bridge to the north into the existing alignment. Installation of the expansion joints and asphalt pavement of final approaches. Removal of existing detour and temporary foundation from the barge. Construction commenced in late 2012 with an anticipated completion date of 2015. Dufferin Construction was retained by the Owner early in the design phase to collaborate with a Design Team to provide construction manager services for this project. This procurement model is known as Construction Manager General Contractor or “CMGC”. During the design phase of the project, DCC worked alongside with the designer and the Ministry to provide construction expertise to complete a project design that provides value and meets the project goals. DCC provided input with regards to schedule, phasing, constructibility, innovative construction approach, cost estimated and plan reviews. Dufferin is responsible for the project schedule, project planning, coordination of subcontractors and the implementation and administration of an approved quality management system. Dufferin Concrete, a sister division to Dufferin Construction Company, will be supplying the ready-mix concrete for the project while another sister division, Dufferin Aggregates, will supply the granular material.